"We the People" are on the move! So many absurdities abound in our lives that there's a whole body of philosophical thought called "absurdism," as well as an entire catalogue of plays called the "theater of the absurd." 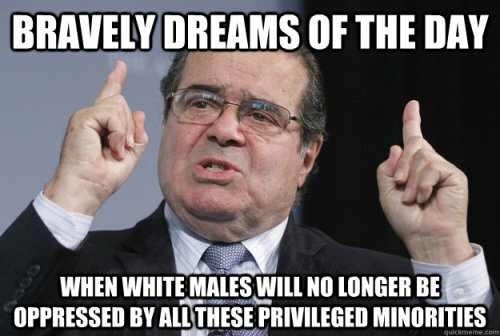 And then there's Antonin Scalia. This sour, scowling, and snarky Supreme Court Justice personifies the dictionary definition of absurd: "Utterly or obviously senseless, illogical, or untrue; contrary to all reason or common sense; laughably foolish or false." A right-wing dogmatist and extreme judicial activist who's full of himself, Scalia has been the court's chief monkey-wrencher for corporate interests, constantly messing with the Constitution to enthrone plutocratic money over our people's democratic politics. By black-robed fiat, he and his four fellow corporatists on the bench have managed to twist language and pervert nature itself by declaring that corporations are "people" and money is "speech." Thus, in their now infamous Citizens United edict of 2010, the five decreed that these huge, lifeless, paper constructs -- without brains, hearts, souls, or tongues--must be free to "speak" in our elections by spending unlimited (and undisclosed) amounts of their shareholders' money to determine who wins public office. Two years later, questioned in a CNN interview about the logic of this finding, Scalia leapt from the merely preposterous to the phantasmagoric, insisting that the founders themselves would've approved extending the human right of political speech to these imaginary corporate persons. Doing so, proclaimed the legal contortionist, increases the level of democratic participation, so it's inherently good: "I think Thomas Jefferson would have said, 'The more speech, the better.'" Good grief! What we have here is one of the most powerful officials in America, one of nine supreme arbiters of what the wording of the Constitution means, who's either (1) sublimely ignorant about the core democratic beliefs of a key author of our nation's founding documents; (2) an ideological delusionalist; or (3) a shameless liar. Start with the fact that the word "corporation" appears nowhere in the Constitution. That is not by accident. Jefferson (along with Madison and other founders) abhorred any participation in the people's business by these predatory corporate beasts. Unlike Scalia, Jefferson had no trouble distinguishing between an actual human being and a piece of paper, which is what a corporation is. He saw them as plutocratic vultures poised to overpower our fledgling democratic experiment, supplanting it with a corporate aristocracy that would plunder and impoverish the people. He would have just as soon ripped out every red hair on his head than extend political speech to the vast piles of wealth stored in corporate treasuries. July is the month of Independence Day -- America's birthday! Time to barbeque, do a few 12-ounce elbow bends, and set off some fireworks. Oh, yeah, and maybe we should pause for a moment or two to reflect on that thing Jefferson wrote 238 years ago -- that's right: the Declaration of Independence. In fact, "We the People" are faced -- right now -- with another of those "when in the course of human events" moments Jefferson wrote about. Not only is this a month to reconnect with our revolutionary heritage, but it's also an appropriate month for re-declaring our independence, this time, from "They the Corporations." 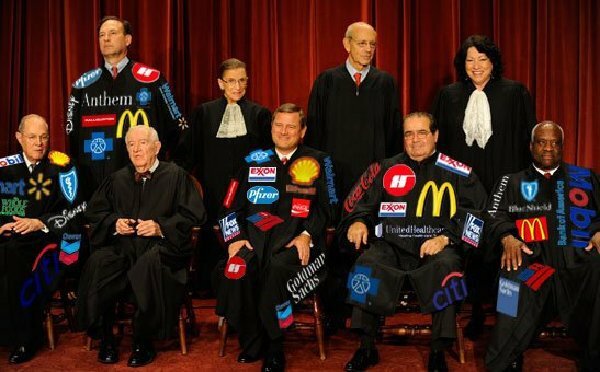 With little coverage by the mass media, and with the complicity of most lawmakers, domineering corporations have quietly but aggressively used the High Court itself to write them and their money into the Constitution as our sovereigns. As legal scholar and democratic activist Jamie Raskin said in testimony to the US senate judiciary committee this June: "In several recent 5-4 decisions, the wall protecting democracy from plutocracy has been crumbling under judicial attack." Let's call out the names of the Court's corporate clique that is mounting this concerted offensive on your and my inalienable right to be a self-governing citizen: Scalia, Samuel Alito, Anthony Kennedy, John Roberts, and Clarence Thomas. Just one year after their Citizens United decision unleashed CEOs to be able to roll truckloads of their shareholders' funds into our elections (without asking those shareholders for permission or even informing them after the fact), that same five assaulted our democracy again. Their 2011 verdict in the Arizona Free Enterprise Club case increased the volume of CorporateSpeak in elections by decreasing the speech of non-rich candidates. Specifically, they rejected the will of Arizonans who had voted to provide public funds for candidates who are willing to forego all special-interest money. This system gave the political ideas of the non-wealthy a chance to be heard when up against the multimillion-dollar PR megaphones of the Koch brothers, Karl Rove, BigOil, the Walmart heirs, and other super-wealthy oligarchs. Public financing of elections was successfully widening public debate and freeing up political speech, so the five corporate supremists stepped in to kill it, absurdly declaring that such laws give an "unfair advantage" to little-guy campaigns. Next came this year's McCutcheon opinion, in which the same five blew the lid off the limits on money that an individual can pour on candidates during any given election cycle. The limit had been $123,000 -- high enough that only about 600 people out of our 330 million reached that maximum in 2012. The Court's narrow majority lifted the allowable total for one person's election-year spending to a stunning $5.9 million. That empowers a handful of the richest of rich donors -- even fewer than 600 -- to overwhelm the political voices of millions of common citizens, all in the name of free speech. Adding to this absurdity, this five-man wrecking crew blithely declares in its McCutcheon ruling that even transactions that appear to be obvious conflicts of interest are permissible (e.g., a CEO can give $25,000 to the head of a congressional committee -- the same person who a week later can put a bill on the floor to benefit the CEO's corporation). Such corrupt transactions apparently "do not justify" putting restrictions on campaign contributions. Instead, the wily ones ruled that the only donor-to-donee corruption that can be regulated is outright quid pro quo bribery. And do not think that this is as far as the Court will go to empower Big Money. Already, corporate lawyers are asking the judiciary to strike down all limits on what each millionaire/billionaire can spend to elect or defeat any number of candidates, and they're pushing to reverse 29 state bans on campaign donations during legislative sessions (when lawmakers and lobbyists are in heat and most open to exchanging favors for money).